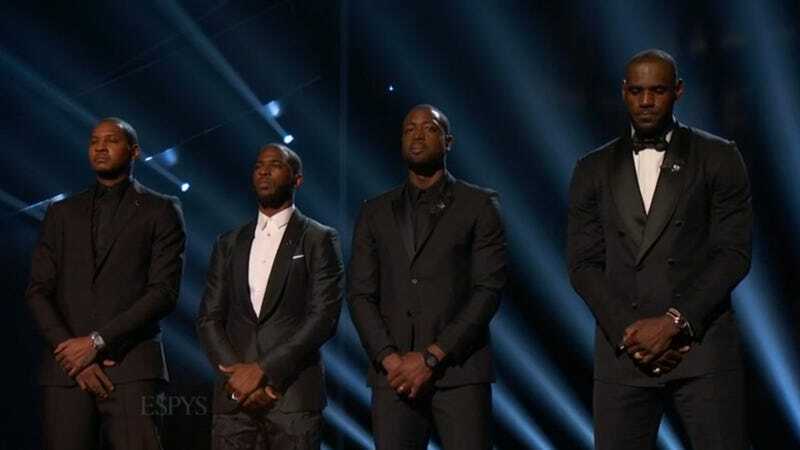 NBA stars came together for the opening of Wednesday night's ESPY Awards to call for an end to violence. LeBron James, Dwyane Wade, Chris Paul and Carmelo Anthony spoke about the recent police killings of Philando Castile and Alton Sterling, as well the Dallas sniper killing of five police officers. "We can't ignore the reality of the current state of America," Anthony said. "The events of the past week have put a spotlight on the injustice, distrust and anger that plague so many of us. The system is broken. The problems are not new, the violence is not new and the racial divide definitely is not new. But the urgency to create change is at an all-time high." Paul continued to say that although he has a family member who is a cop, Castile and Sterling's reality is also their reality. Paul also mentioned past athletes who took a social justice stand. "Generations ago, legends like Jesse Owens, Jackie Robinson, Muhammad Ali, John Carlos and Tommie Smith, Kareem Abdul-Jabbar, Jim Brown, Billie Jean King, Arthur Ashe and countless others, they set a model for what athletes should stand for, so we choose to follow in their footsteps," Paul said. James' comments were as equally poignant as he stressed that athletes should be giving back to their community. "We all feel helpless and frustrated by the violence. We do. But that's not acceptable," James said. "It's time to look in the mirror and ask ourselves, 'What are we doing to create change?' Let's use this moment as call to action for all professional athletes to educate ourselves, explore these issues, speak up, use our influence and renounce all violence." James continued, "And most importantly, go back to our communities, invest our time, our resources, and help rebuild them. Help strengthen them. Help change them. We all have to do better." And Wade spoke about racial profiling and how it must come to an end. "The racial profiling has to stop," Wade said. "The shoot to kill mentality has to stop. Not seeing the value of black and brown bodies has to stop. But also, the retaliation has to stop. The endless gun violence in places like Chicago, Dallas, not to mention in Orlando, it has to stop." Wade continued, "Now, as athletes, it's on us to challenge each other to do even more than what we already do in our own communities, and the conversation cannot, it cannot stop as our schedules get busy again. It's won’t always be convenient; it won't, it won't always be comfortable, but it is necessary."